With 239 employees, CYBNY achieved impressive organic growth of 14.5% in FY2017. Overall, revenue grew from €14.64 million ($16.94 million) in FY2016 to €17.19 million ($19.90 million) in FY2017. Miami, FL – August 6, 2018 (EmergingGrowth.com NewsWire) — EmergingGrowth.com, a leading independent small cap media portal with an extensive history of providing unparalleled content for the Emerging Growth markets and companies, reports on CYBER1. (NASDAQ: CYBNY). Two acquisitions announced in June this year (bringing the total to 11 acquisitions over the past two years), bring annualized revenues of nearly €30m ($34.7 million) into the enlarged group and bring the company into run rate profitability, according to the analyst report by WH Ireland. Further WH Ireland research projects FY2018 revenue at €43.60 million ($50.44 million), FY2019 revenue at €63.56 million ($73.53 million) and FY2020 revenue at €73.10 million ($84.56 million). Get the WH Ireland Analyst Report here. CYBER1 (OTC – Nasdaq Intl: CYBNY) has prominently positioned itself as one of the foremost players in the cyber resilience space. 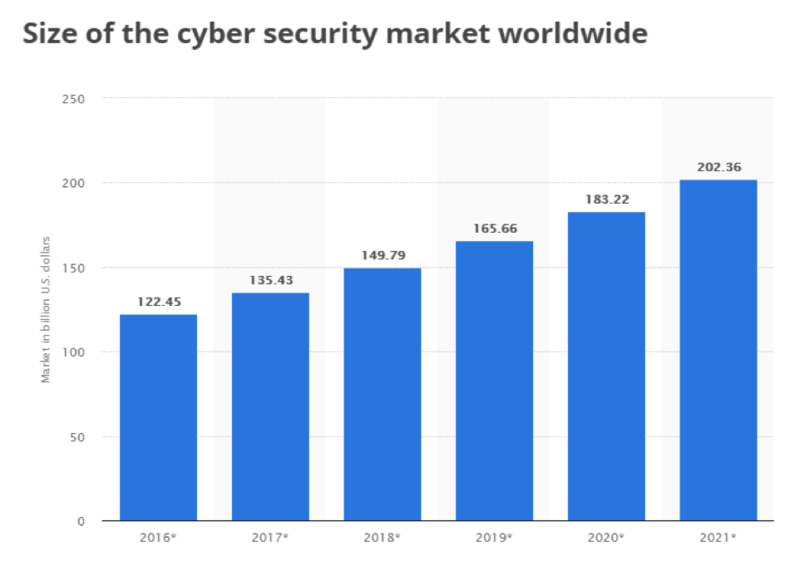 Operating in Europe, Middle East and Africa, the company’s strategic approach could fundamentally disrupt the global cyber security market, which is expected to be worth $202.36 billion by 2021, up exponentially from $135.43 billion in 2017, according to data from Statista. In an exclusive telephone interview, CYBER1 Chairman and founder, Kobus Paulsen, explained that few cyber security companies had fully understood the underlying industry dynamics. “Most cyber security companies today offer a limited range of products. However, this one size fits all approach does not correspond to the concrete realities in the global market,” explained Mr. Paulsen. Mr. Paulsen observed that this approach, which is at the heart of CYBER1’s strategy, helps companies and organisations enhance their level of cyber resilience. Organisations today realise that while protection is key, resilience is even more important. Protection is threat specific, narrowly focusing on mitigating against a particular kind of breach, while resilience is about ensuring overall business continuity amidst an evolving range of cyber security threats. “Few cyber security companies can authoritatively say they offer solutions geared towards cyber resilience, yet this is what the market demands,” said Mr. Paulsen. “At CYBER1, we are not just giving you the technology, we also implement it, install it, manage it and conduct offsite and onsite monitoring of the entire cyber security environment for companies,” he further ventured, emphasizing that this kind of approach is what the market demanded. Because of its approach, CYBER1(OTC – Nasdaq Intl: CYBNY) has gained notable traction over the past year. It achieved impressive organic growth of 14.5% in FY2017. Overall, revenue grew from €14.64 million in FY2016 to €17.19 million in FY2017. Organic growth is typically a reliable indicator of a product or service offering’s responsiveness to market needs. This strong responsiveness to market needs explains why CYBER1 has been able to secure contracts in sectors where cyber security is business-critical. “Due to the confidential nature of contracts in our sector, we cannot disclose the identity of our clients. However, as a snapshot, I can confirm that we currently have clients such as financial institutions, national telco carriers, government departments, energy authorities, international standard agencies, travel and leisure companies and general industrial conglomerates,” disclosed Mr. Paulsen. The profile of these customers—who are drawn from markets as diverse the U.K., Austria, UAE, Kenya, Ukraine, Italy, Germany, Greece, Turkey and South Africa—speaks volumes about CYBER1’s product and service range. CYBER1 (OTC – Nasdaq Intl: CYBNY) trades on the Nasdaq Nordic, but with its recent American Depository Receipt (ADR) is currently available to U.S. investors. This presents an opportunity for U.S. investors to be part of the growth narrative of a company that understands the underlying industry dynamics in the global cybersecurity market. Sponsored by the Bank of New York Mellon (NYSE: BK), CYBER1’s ADR trades just like regular U.S. stocks. It is currently trading on a 10-to-1 basis in the U.S, meaning that 1 share of the company in the U.S. represents 10 shares in Sweden. CYBER1’s (OTC – Nasdaq Intl: CYBNY) ADR not only gives the company a listing presence in the U.S., but also presents U.S. investors with an opportunity to realise potentially impressive capital gains. The stock’s current visibility and accessibility in the U.S., coupled with its market-driven business strategy, heightens the prospect that it could get long-term institutional investors in the U.S. in the mid-to-long-term. This means that there could be significant upside potential for investors who establish a position now. At the time of writing, CYBER1 had 239 employees globally. As a company operating in the knowledge economy, the ability to attract such an expansive pool of talent, including a strong management team, is an indicator of competitiveness. It shows that there is minimal dependency on key personnel and that systems and protocols are in place to ensure business continuity. Moreover, increased availability inhouse personnel with specialised cyber security skills will allow the company to grow its managed services and advisory verticals, which are generally higher margin areas compared to the product vertical where software is bought from vendors and resold to customers at a modest markup. Tellingly, CYBER1 (OTC – Nasdaq Intl: CYBNY) derived nearly 50% of revenue from advisory and consultancy in FY2017. As its human capital expands both in size and quality, it will be able to grow the revenue shares of these high margin verticals, hastening its move to profitability. Overall, the company is expected to grow robustly on a topline basis in the next couple of years. Analyst research conducted by WH Ireland projects FY2018 revenue at €43.60 million, FY2019 revenue at €63.56 million and FY2020 revenue at €73.10 million. These impressive projections are informed by CYBER1’s acquisitive growth model, through which it acquires revenue generating companies that offer diverse products across multiple markets. This multi-product and multi-jurisdictional approach, coupled with advisory and management support, strengthens CYBER1’s positioning as a leading cyber resilience partner. “We are a buy and build play; acquisitions are an integral part of our strategy and we have successfully executed 11 acquisitions over the past two years, with 5 of these being in 2017,” noted Mr. Paulsen. “Through these acquisitions, which are executed via an established acquisition model of 20% cash and 80% stock, we gain access to the acquired company’s customer base and vendor relationships,” he added. These vendor relationships have helped position CYBER1 as a multi-product company that is able to single-handedly meet the evolving and multi-faceted needs of customers in multiple jurisdictions. CYBER1 currently distributes products for 68 (and growing) leading vendors, including McAfee (formerly Intel Security), HP Enterprise Security (now part of Micro Focus) and Israeli multinational, Check Point. As CYBER1 (OTC – Nasdaq Intl: CYBNY) executes more acquisitions within different verticals in cyber security, it will need to clearly distinguish itself from its subsidiaries. The recent rebranding is partly aimed at achieving this. On July 13, 2018, Cognosec AB rebranded to CYBER1 after receiving approval from shareholders at the previous month’s Annual General Meeting (AGM). The rebrand also entailed a change in the company’s logo. “Following several acquisitions, the decision to rebrand the parent entity marks the beginning of the next chapter for our company. CYBER1 will provide both consumers and investors with a clear message and understanding of who we are and what we do, and it is our intention to drive this brand globally, in conjunction with both strong organic and acquisitive growth,” Mr. Paulsen observed in the press release announcing the rebrand. 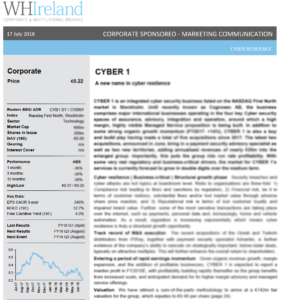 The continued acquisition of companies, which is key to CYBER1’s strategy, could result in sustained double-digit growth in revenue in the next couple of years, as previously explained. More importantly, acquisition of revenue generating companies could accelerate CYBER1’s journey towards being profitable. Two particular acquisitions in the recent past stand out: the one involving the Greek and Turkish distributors of ITWay and the other involving payment security specialist, Advantio. Both acquisitions, which were announced in June this year, bring annualized revenues of nearly €30m into the enlarged group and bring the company into run rate profitability, according to the analyst report by WH Ireland. CYBER1’s (OTC – Nasdaq Intl: CYBNY) run rate profitability is a significant milestone and yet another pointer to the ingenuity that underpins its acquisition strategy. By focusing only on revenue-generating plays at attractive multiples, while limiting the involvement of cash in deals, it is able to grow fast but sustainably. “Growth needs to be sustainable. That is why our M&A team uses a rigorous criterion to evaluate potential acquisition targets,” elaborated Mr. Paulsen. The fact that the company has an established acquisition model of 20% cash and 80% stock and focuses exclusively on revenue-generating undervalued targets clearly illustrates that it is able to balance its growth ambitions, the overall financial health of the company, and the preservation of shareholder value. By limiting the involvement of cash in its deals, CYBER1 is able to preserve this critical asset for operational purposes, giving its business sufficient liquidity to remain competitive and nimble. At the same time, by using stock in deals and only focusing on undervalued revenue-generating companies, CYBER1 ensures that the resultant dilution is offset by the upside potential of these undervalued acquisition companies. “We are not only interested in being profitable, but staying profitable, a milestone that is almost unheard of in our space,” he further explained. “Few cyber security companies of the same and even larger size are on a clear path to profitability. This is something that distinguishes us and illustrates that we are ready to partner with long-term institutional investors in the U.S.,” said Mr. Paulsen. As an example, cybersecurity company FireEye, Inc (NASDAQ: FEYE) is still in loss making territory, despite enjoying strong investor interest as illustrated by its $3.2 billion market cap. The company posted losses of $303.69 million in the year ended December 31, 2017 against revenue of $751.08 million over the same period. Palo Alto Networks (NYSE: PANW), another bigwig in the cyber security space with a staggering $19.52 billion market cap, posted losses of $216.60 million in the year ended December 31, 2017 against sales of $1.76 billion over the same period. The script is similar for the vast majority of cyber security companies, indicating that CYBER1’s imminent profitability will set a clear precedent in the industry, especially considering it has a $111.17 million market cap. The share price appreciation could be astronomical given the valuation. Research indicates that the average price-to-sales ratio in the cyber security industry is around 10x. Currently, CYBER1 (OTC – Nasdaq Intl: CYBNY) is trading at a price to sales ratio of 5.43. It is fairly valued and has the right mix of positive fundamentals and strong earnings potentials, with the prospect of profitability now well in the horizon. The company could emerge as a strong buy and hold candidate for long-term institutional investors keen on playing the cyber security boom.